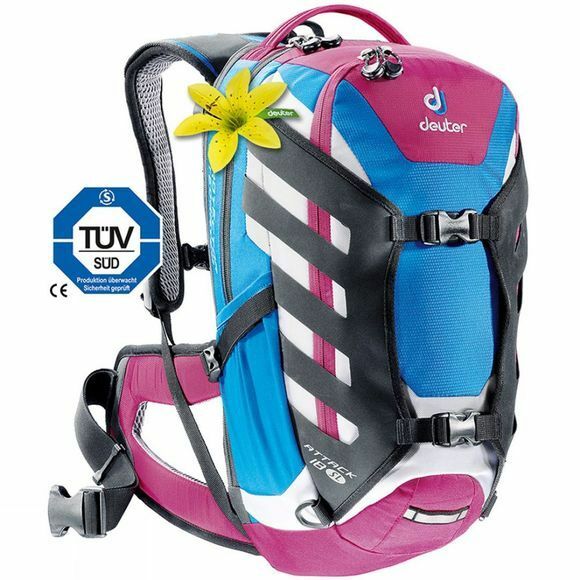 The Womens Attack 18 SL Rucksack is the backpack with “protective” instincts and is tweaked for safety and aimed at adrenaline junky mountain bikers. Technically suited to freeriders’ needs, it is the perfect partner for spontaneous journeys off the beaten track with its TÜV/GS certified PSA back system made of visco-elastic SC1 foam. If not needed, you can remove the protector and use the Attack for less challenging bike rides. The pack’s smart solutions easily accommodate all the equipment and the SL model is specifically designed to fit the anatomy of female riders. Front pocket with great organisation including 3 mesh pockets for tools, first aid kit etc.